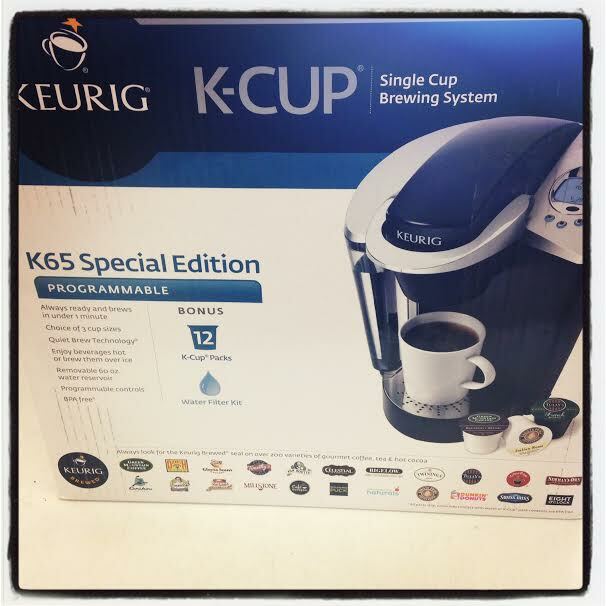 I know you are wondering who/what/when/where and how my first cup of coffee happened yesterday morning after my Keurig incident. It turned out that I was able to play around with the old machine just enough to squeeze out a cup of coffee. But that didn’t matter – all trust was lost. It is quite possible my old machine would have continued to work after the minor unexplainable failure but trusting that my coffee will brew each morning is a serious matter not to be taken lightly therefore I had no choice but to get a new Keurig machine yesterday. Fool me once shame on you. Fool me twice? Shame on me. Anyway, how do we feel about dirty sneakers? I am really not a fan of the battle wounds displayed on my Adidas Energy Boosts from Saturday’s long run. In fact, I wasn’t a fan of anything about that long run at all. Saturday’s long run in the windy wet and raw air was rough. Not just on my shoes but on me mentally which of course affects you physically. Nothing hurt but I struggled to complete the run. Make no mistake, I was never close to calling it quits. I knew that, my legs knew that, but that didn’t help since I just wasn’t my usual chipper-running self. Lately my runs have been fabulous. I have been flying, feeling great, hitting consistently quick and happy paces in my favorite sneakers. Except Saturday. Saturday was just overall tough and I don’t really know why. I am no machine. That’s what I kept reminding myself. Doesn’t matter that I had my sweet potato the night before, doesn’t matter that I hydrated or wore the right shoes and gear or that I ate my ritual prerun breakfast. We are human. We can’t be programmed to run a certain way each and every day. This idea sort of leads me into a review of the Fitbit One. All of these new gadgets that are designed to track our every move almost makes us people seem as though we are machines. We aren’t, but marketing people in the tech world are going to try to make us believe that we are. 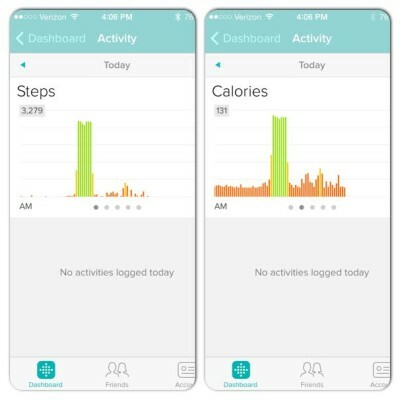 I don’t get all giddy about gadgets and gizmos but this latest tracking craze at first glance seemed kind of cool so when my friends over at Verizon Wireless offered me the opportunity to test out the new Fitbit One, I gladly accepted. By attaching the Fitbit One on to your tank strap, belt loop or placing it somewhere you won’t lose it on your body, the Fitbit One tracks your steps, miles, stairs climbed, calories burned, sleep patterns and food intake (should you log in your meals). 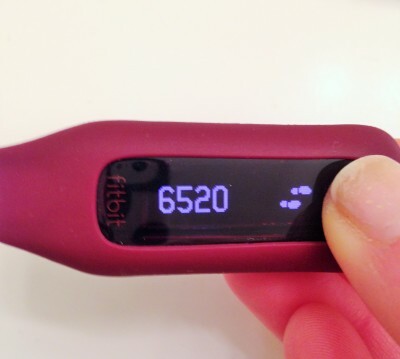 Before I get to my opinion, let’s start with the fact that you kind of need to know what you weigh in order to set up your Fitbit One. And we know I don’t own a scale, believe in the scale or want to know from the scale. But, I realized that not all of you feel the way I do and even more of you would probably like to know if the Fitbit One would assist you in achieving your goals, keep you motivated to move more and stick to eating a balanced diet. So, I stepped on a scale for us in order to do this review properly. We actually need to discuss the number I saw on the scale in a later post because while the number means nothing, the number I saw can offer us even more proof as to why it means nothing. Setting up the Fitbit was as easy as pie. Not that making a pie is all that simple unless you are using a store-bought crust and even then disaster can strike. The best part of this whole Fitbit experience was the ability to tap the app on my iPhone and immediately see my “stats”. The app never froze, always loaded and didn’t drain my phone battery. Not all that accurate. 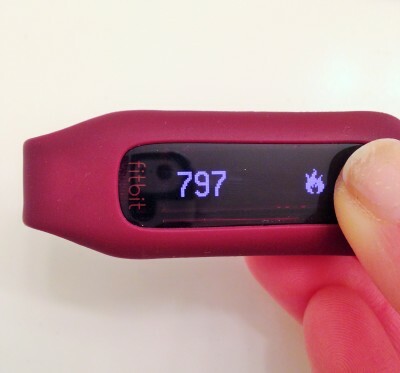 So here’s the thing – just because you enter your weight, the Fitbit doesn’t know how much of that number is muscle or fat which really helps to accurately dictate how many calories you burn. I think the Fitbit is based upon estimates which I guess is good enough just to give you a basic idea of what you may burn in a day. 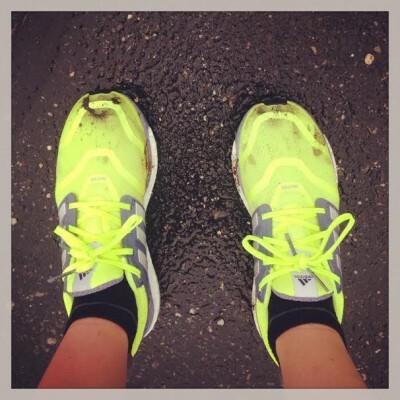 The steps, miles and stair tracker wasn’t accurate – I know how many miles I run based upon my route. The tracker was off every time, along with the steps I took and stairs I either climbed or didn’t climb yet it thought I climbed. It also couldn’t track treadmill runs and miscalculated elliptical workout minutes as well as strength training. I don’t track my calories – No surprise here but I didn’t use the food log to track my calories. For me to keep track and monitor the amount of broccoli I eat at a meal or the number of apples I consume in a day just doesn’t seem right. The sleep tracker was interesting – I don’t even understand how it works but the sleep tracker will show you how often you were restless, awake or asleep throughout the night. There were plenty of nights where I got up to the go to the bathroom and the tracker told me in the morning that I slept during that time. Not accurate. I was extremely confused when syncing my runs from MapMyRun to the Fitbit. It never really worked properly and if I tried to manually entered my runs, if I didn’t enter the data TO THE MINUTE, everything became completely thrown off and miscalculated. I think it’s a fun little gadget. For someone else. I don’t like numbers. I don’t count calories and don’t want to monitor my weight. This thought process may not cross everyone’s mind but for me, I just don’t need it. I run enough, I move enough, I eat decent enough and really, if I want to sit down on the couch, it should be OK. 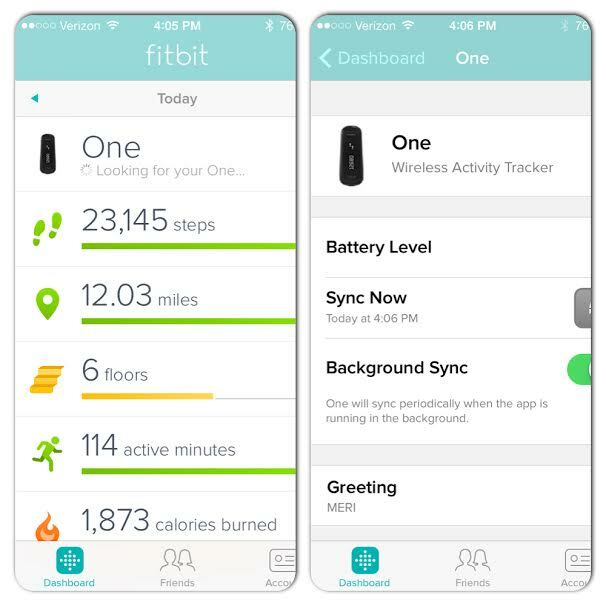 The best thing about the Fitbit One for me though was realizing just how many calories it claims I was burning. While I knew we burn calories just by breathing, seeing you burned a few hundred in your sleep makes you realize just how important it is to EAT ENOUGH. In fact, since using the Fitbit, I have been making more of an effort to grab an extra snack here and there, especially on the days when I run. Society gets so caught up in the whole losing weight craze that the idea of food is fuel is often lost. We need to eat to fuel our metabolism and bodily processes in order to take all of these steps we are supposed to be stepping. 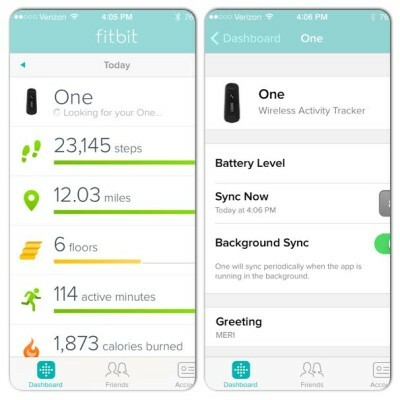 Has anyone else used the Fitbit or another tracking device? I would love to know what you think! Verizon Wireless provided me with the Fitbit One for review. No further compensation was provided. All thoughts and opinions expressed in this post are my own. I am not all that tech savvy so it is quite possible I didn’t understand every feature available with the Fitbit One. I think I would start to get out of control about the numbers if I tried one of those, even though logically I know we can’t be broken down that way. I think seeing “stats” just invites you to evaluate yourself by the numbers and I’m not a fan of that. I was always curious about the sleep data though! 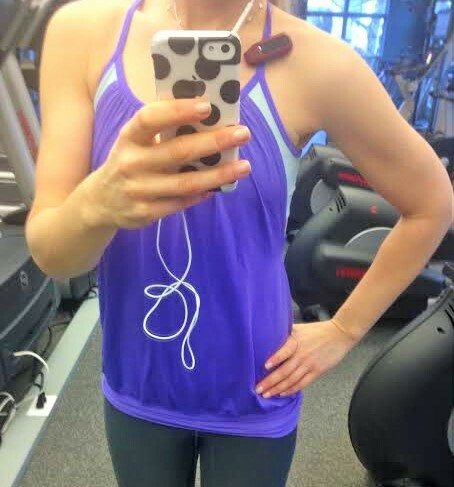 I know we are talking about fitbit but… You always have the cutest workout clothes! I don’t bother with stats anymore but I do see the positive things people would get from them. Totally agree with you…People managed just fine before all of these gadgets. I even think about this when I forget my phone at home. Some how I used to manage without one, right? lol…The step tracking, calorie tracking and every breath tracking is a bit too much for me. I’m not sure how functional a fitbit would be for me because I am definitely one of those people who can latch on too hard to numbers. I do occasionally wear my polar HR monitor but that’s mostly because when I wear it I’m less likely to take a nap on the gym bench (which I have a habit of doing) but when I’m doing cardio or just going for a walk it doesn’t concern me how far I go or how many calories I burn. Thankfully that habit bit the dust! I am hysterical laughing right now picturing you asleep on the gym bench. lol Thank you for making me giggle. This kid is definitely necessary to me! The strict budget simply kills me sometimes 😉 I love figures, and I honestly can tell that I was obsessed with them a few years ago (to consider each sting and every minute activities… bad times). Anyway, I love when figures a little indistinct is sets the direction, instead of concludes in a framework. Your reasons for why you won’t keep using the fitbit are the same reasons for why I haven’t bought myself one. I love numbers but I don’t want them to consume me. I don’t need to add fuel to the fire. I know I’m healthy enough, work out enough, and a little clip on gadget can’t monitor my overall health. I would be interested in trying one for a day sometime to really drive home the calorie thing. I think it is shocking to see how many calories we burn on any given day, even without exercise. For that reason alone, I wish you could test one out. Waking up to see you burned (or at least an estimated burn) of a few hundred calories is good for people to help drive home the point that food is fuel. As much as a I love to eat and love to run, the more I run, the more I need to eat- not just for my runs but for the rest of my body to keep functioning. I’m going to invest in a FitBit soon but I’ve been holding out to see everyone’s opinion before I spend the money. I’m also a little worried I will obsess too much about what it says, but I love the idea behind it!